Lady Dido Belle with her cousin Lady Elizabeth Murray. Formerly attributed to Johann Zoffany. One might as well begin with this painting. 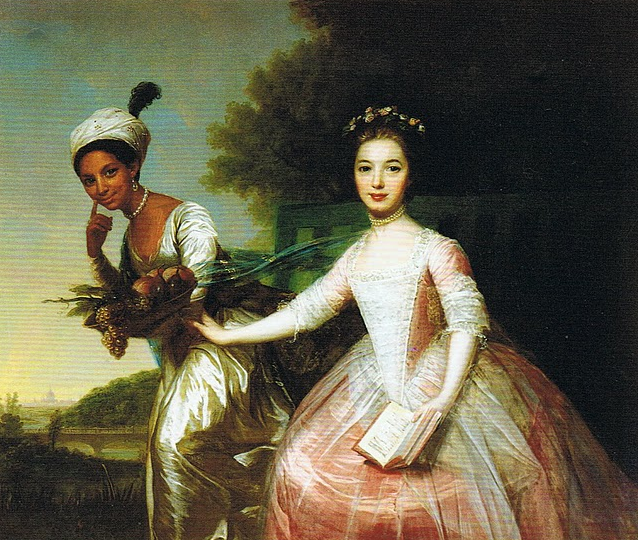 In this image, we see two women of status, Dido Elizabeth Belle alongside her cousin, white Lady Elizabeth Murray. It is an oil portrait from 1779. I’m no art historian, but I can tell you that the image communicated an intimacy and nod towards an equality in social status that I hadn’t seen in European paintings of dark skinned peoples from the medieval through to the Victorian period. A great Tumblr, People of Color in European Art History has collected a host of images and in most of them, the darker body is subordinate to the lighter body. While Murray assumes considerable real estate in the foreground of the painting, there is great care in the representation of Belle. She is not darkened nor obscured, her gaze is fixed and direct; she is smiling and is dressed as an aristocrat. The portrait is exceptional for these reasons. Other images of the period present a black identity negatively and these images exist in great abundance. And what we learn from looking back at these images is telling: the white European perception of our bodies, our beauty rendered in such monstrous ways to the edification of whiteness is the tool of white supremacy. We are very much still negotiating the impact of seeing images that erase and obscure black beauty and humanity today. 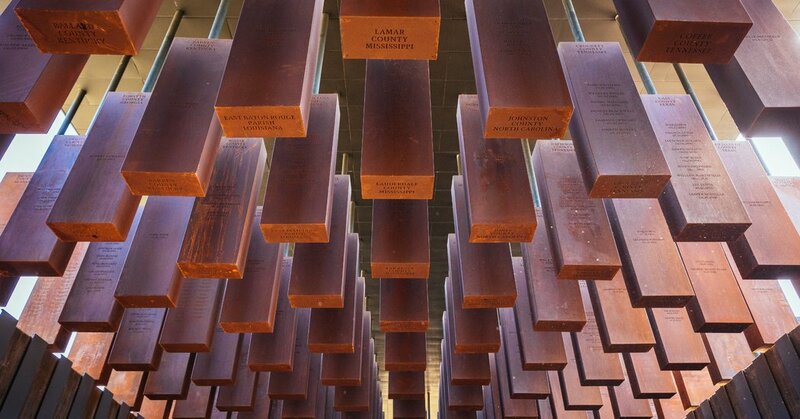 Our blended histories have yet to be accurately represented in popular consciousness, so every old story uncovered becomes a new retelling and a demand that we examine some painful truths about our past and how it shapes our present. It is this painting that serves as inspiration to BAFTA award winner Amma Asante’s sophomore feature film, Belle, which opened in select US theaters May 2nd. Belle is a period piece that embraces our lived intersections in race, class and gender. Dido Elizabeth Belle (Gugu Mbatha-Raw), the biracial offspring of an enslaved African (Maria Belle) and British Admiral Sir John Lindsay is left under the guardianship of Lindsay’s aunt and uncle, the first Earl of Mansfield, William Murray (Tom Wilkinson), who is later revealed to be the lord chief justice deliberating on the Zong slave ship massacre where the crew was accused of drowning 141 enslaved Africans for insurance money. “You are most loved,” Lindsay tells his daughter before leaving her as a ward to his aunt and uncle at a genteel, sprawling English country home. From the beginning we watch Dido the child process the impact of the family oil portraits where she sees bodies similar to hers, subordinate to the white ones, prostrate, destitute, or desperate. Dido is haunted by these images as a child – In one heartbreaking scene, Dido violently rubs her face in a symbolic effort to remove her darkened shade. When Earl Murray arranges for the cousins as young women to sit for the family portrait, Dido is immediately panicked by the prospect. We understand Dido’s trepidation, her fear that her likeness –her very self– will be diminished or obscured. We are left with a relic that absolves that fear. The painting is proof that this brown woman in 18th century Britain was loved. Dido and Elizabeth are of marrying age, and this is 18th century Britain, so we witness the young women navigate orchestrated courtships and marriage proposals. Bette has the great misfortune of not having a dowry (Dido is left a significant sum from her father). It is here where we get into the nuanced weeds around the very restricted roles of women. Dido doesn’t have to marry for money, yet she is a woman of status, and she is also black. Is there a suitor of noble status that can accept this metaphysical condition without damning her to persistent humiliation? Belle is wonderful and satisfying in exploring these questions. Asante and screenwriter Misan Sagay imagined a drama rooted in art history and politics, presenting us with an alternate narrative from the horrors we witnessed in McQueen’s Oscar-winning film 12 Years A Slave. Mbatha-Raw’s Dido is fierce, charming and vulnerable. Belle features a fantastic supporting cast, including Wilkinson’s Murray, Sam Reid (John Divinier), and Sarah Gadon (Elizabeth) who are all outstanding, as well as a cameo from Tom Felton (Malfoy from the Harry Potter series), who really inspires all of the feels in the colors of rage, hate, shade and bile. While the true life story of Dido Elizabeth Belle doesn’t quite align historically with Earl Mansfield’s actual deliberations on the Zong case, Belle is a compelling film. It is ‘Austen-eque’ in its narrative of the blurred lines between laws (social, moral, cultural, natural) and love in 18th century England. It is at its heart a very intimate family and coming of age story. Murray and his wife overcome their racism (in their own way), showing great love to Dido. Dido succeeds in finding love for herself, reflected in the eyes of another. Dido’s journey to a full and complete personhood under such circumstances dazzles. Syreeta McFadden hopes Belle will one day sit alongside her most prized DVD box set of the BBC-produced Pride and Prejudice miniseries. Oh what? You didn’t know? Listen… BARS, Guys. LIZZY BENNET’S GOT BARS FOR DAYS. Peep her speech to Lady Catherine De Bourgh and not tell me De Bourgh got p’wned.